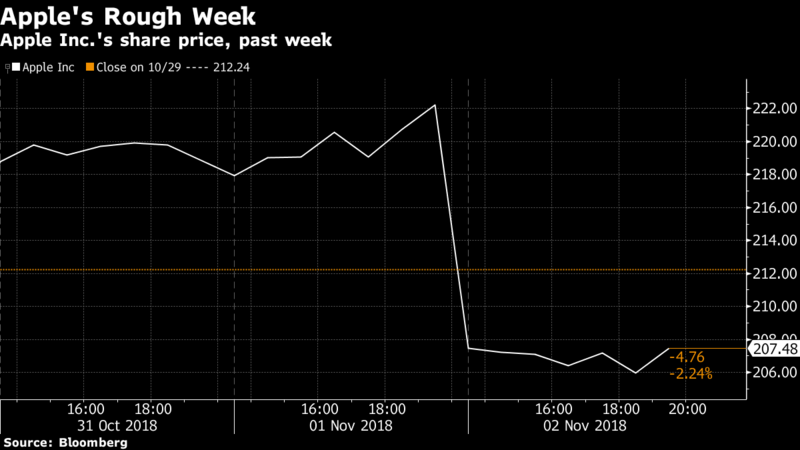 Shares of Apple Inc. and its major suppliers fell sharply on Monday, following a report that the company was canceling a production boost for its iPhone XR line, adding to concerns about the outlook for its biggest product category. Apple dropped 2.8 per cent at 11:40 a.m. in New York. The Dow component has dropped almost 10 per cent over the past two trading sessions, on track for its biggest two-day skid in more than five years. Nikkei reported earlier that Apple told Foxconn Technology Group and Pegatron Corp. to halt plans for additional production lines dedicated to its lower-priced iPhone XR line. The report, which cited unidentified people familiar with the matter, said Foxconn’s production would be down 20 per cent to 25 per cent from its original outlook. Last week, Apple gave a tepid outlook for its holiday quarter and said it would stop providing unit sales for iPhones, iPads, and Macs in fiscal 2019. Apple suppliers also fell on the Nikkei report. Qorvo Inc. slid 7.3 per cent, on track for its biggest decline since November 2016. Cirrus Logic Inc. dropped 4.92 per cent and On Semiconductor Corp. was down 2.4 per cent. Skyworks Solutions lost 4.1 per cent. “The market has been exceptionally momentum driven, and now this ultra-sensitive market is just shooting first and asking questions later on these more cyclical names,” said Katz, who owns Apple shares. The declines are just the latest in a recent period of weakness for major technology companies, a sell-off that has been fueled in part by concerns over waning demand. Both Amazon.com Inc. and Google-parent Alphabet Inc. gave weak outlooks in late October, as did major semiconductor stocks like Texas Instruments and Advanced Micro Devices. Even with the weakness, however, many tech stocks remain strong performers over longer time frames. Apple remains up about 19 per cent for 2018.